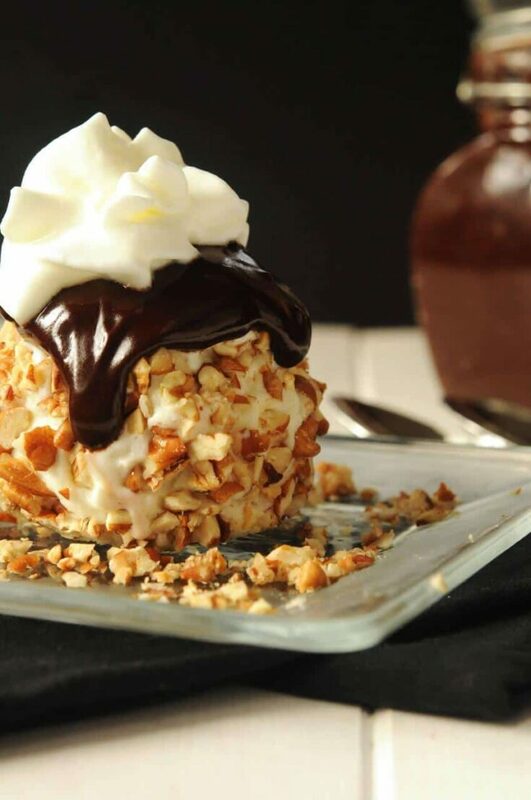 Pecan-Covered Ice Cream Balls with Hot Fudge Sauce will delight both the kids and adults in your family. You can make it all ahead of time and reheat the fudge sauce at the last minute. So tempting and delicious! Normally I don’t think about Easter dinner anytime before Good Friday. But my relatively new blogging addiction has me thinking about dessert already. Since dinner will be after church, I want something I can prepare ahead of time–as in DAYS ahead of time. I think these retro Pecan-Covered Ice Cream Balls with Hot Fudge Sauce will be perfect. Helen Corbitt, was one of the greatest influences on my cooking because of my previous job in the kitchen at The Greenhouse. She published this wonderful hot fudge sauce recipe in Helen Corbitt’s Cookbook. Her directions called for using a double boiler and cooking for 30 minutes on the stove. I prefer to use my microwave for the same delicious results in a third of the time. First, I get out my trusty 2-quart glass batter bowl. Two trips to the microwave and a good beating will produce a thick, rich, glossy, fudge-y sauce you can reheat (in the microwave if you are careful) at a moment’s notice. Or pour the sauce into a pretty glass jar and give it away. Ms. Corbitt also gave me the idea of making ice cream balls. I usually use vanilla but coffee, chocolate chip, mint, cherry, etc. would all work. Toasting whatever nuts you decide to use will bring out the flavor. 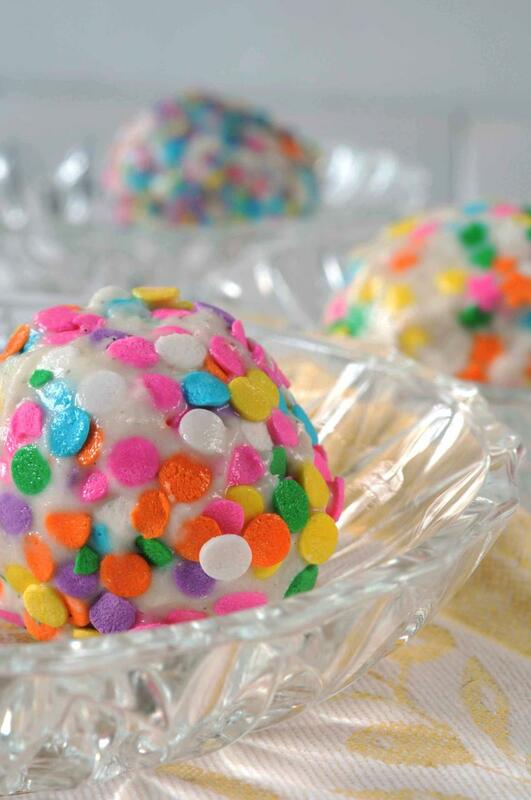 Kids will go crazy for chopped candy or colored sprinkles instead of nuts. Scoop out ice cream. Using plastic gloves, quickly mold ice cream into a rough ball and drop on pile of toasted, chopped and cooled nuts. Roll to cover completely and return to the freezer to harden. Wrap well to store. In 2-quart Pyrex batter bowl, melt butter in the microwave for 1 minute, 15 seconds on HIGH. Stir in powdered sugar. Lay chocolate on top of sugar mixture in glass bowl and pour milk over all. DO NOT STIR. Microwave on MEDIUM for 8 minutes. Check after 5 or 6 minutes. Chocolate should just be melted--no more. If you prefer, heat in a double boiler for 30 minutes. Remove from microwave and add salt and vanilla extract. Beat--slowly at first and then more vigorously. A portable mixer works perfectly but you could also use a whisk. Keep beating until silky smooth. Add cream 1 tablespoon at a time if sauce is too thick but never add water. Store sauce in the refrigerator and reheat as needed. Your fudge sauce calls for bitter chocolate. Do you mean bittersweet or unsweetened? It looks so good and so easy! Lynn, I double checked and it’s just as I thought. Unsweetened. I changed the recipe on my blog. Thanks so much for letting me know because that was confusing. P. S. I left out butter and vanilla. Back in the 70’s, I had a Helen Corbitt cookbook that had a superb hot fudge sauce, different from the one you feature. It had regular milk, unsweetened chocolate, cocoa, sugar, salt, … the rest I’m unsure of, maybe some corn syrup? Unfortunately, I do not recall the proper amounts of the ingredients. I had searched a number of cookbooks and tried innumerable chocolate sauces looking for one easy to make and with a wonderful thick syrupy, glossy consistency. This one was an immediate hit and I made it weekly for our family Sunday night dessert ritual. Do you by any chance know that recipe? YUM! I love ice cream. This is a really great way to dress up store bought ice cream – I love it! I’ll be doing this at my next get together. I love this dessert. YUM! Ice cream is perfect no matter how you serve it!!! You can NEVER go wrong with ice cream. I’d love the pecans and the boys would totally go for the sprinkles! What a fun dessert! I love the ones covered in sprinkles. I just bookmarked this page! I have vanilla and cookies and cream ice cream in the freezer. Several bags of pecans and almonds, and everything I need to try that hot fudge sauce! Mmmmm! Can’t wait! How yummy! My philosophy is, if it’s not chocolate, it’s not dessert. I think I just gained 5 lbs looking at this. Oh My! Those look way too delicious! Mike — sheepishly admitting I have (and use) my mom’s Revereware double boiler (wedding cookware) from ’57. Mike, I think using a double boiler may actually qualify you to be an official chef–unlike me, since I’m always looking for the quickest way to put healthy and delicious food on the table without pouring it out of a can or a box. Just give me the hot fudge and a spoon. YUM! What a fabulous dessert! Ice cream lovers everywhere will love this recipe. You make it look soooooo easy,and as always the photos are awesome! This looks like a luxurious hot fudge sauce. I should have known that you had a culinary background, your desserts are always so exquisite!